My grandmother, her sister and their nanny pose beside St. Clair Lodge in 1895. Lake Memphremagog is hidden behind the trees. Georgeville is a charming village, nestled between the hills and farms of Quebec’s Eastern Townships and the shores of Lake Memphremagog. There is a fancy general store, a park complete with old-fashioned gazebo, and a wharf popular with recreational boaters. The village has a cheerful mix of weekend cottagers and year-round residents. It that respect, it hasn’t changed much in more than 100 years. A few years ago, I discovered that my great-grandparents owned a summer house there. According to the 1895-1896 Lovell’s Directory of Montreal, Robert Stanley Bagg’s summer residence was St. Clair Lodge, Georgeville. I had uncovered another bit of lost family history: although I have owned a small cottage about 15 minutes from there since 1979, I had no idea there was an ancestral connection to the area. Montreal-born Robert Stanley Bagg (1848-1912) studied law and became a businessman. He married Clara Smithers in 1882 and the couple had three children, Evelyn, Gwendolyn (my grandmother) and Harold Stanley. I asked several people around Georgeville whether they knew of a house called St. Clair Lodge, but had no luck. Then Louise Abbott, a friend who is writing a book about the history of Lake Memphremagog, contacted me to ask about my great-grandparents. She had never heard of St. Clair Lodge, but she told me that’s because the property has been called Edgewood for many years. The house is still standing, though much has changed, and Louise sent me some photos. Amongst some old letters and newspaper clippings, I made another discovery: Robert Stanley Bagg donated the bell to the St. George’s Anglican Church. The church too is still standing. This set of furniture set which came from the Bagg house has a new home with the Stanstead Historical Society. There is a good reason why my ancestors spent their summers in Georgeville, apart from the beauty of the place: Montreal was an extremely unhealthy place, especially in summer, and especially for small children. In 1900, the city had a higher infant mortality rate than most Third World countries do today. With no water treatment and inadequate sewers, diarrhea was the biggest killer. Diphtheria, typhoid, tuberculosis, measles and other communicable diseases also posed threats. These conditions affected the poor more than the wealthy, but that was partly because anyone who could afford to leave the city in the summer did so. Many Montrealers summered in the Eastern Townships, known officially today as l’Estrie. Southeast of Montreal, this was originally the territory of the Abenaki First Nations people. American Loyalists started to move into the area around 1791, and Georgeville was founded in 1797 when enterprising settler Moses Copp started a ferry service across the lake. As the population and industry of the Eastern Townships grew, so did the network of railways that crossed the area. Most important was the Grand Trunk Railway, completed in 1853, linking Montreal with the ice-free harbour of Portland, Maine. 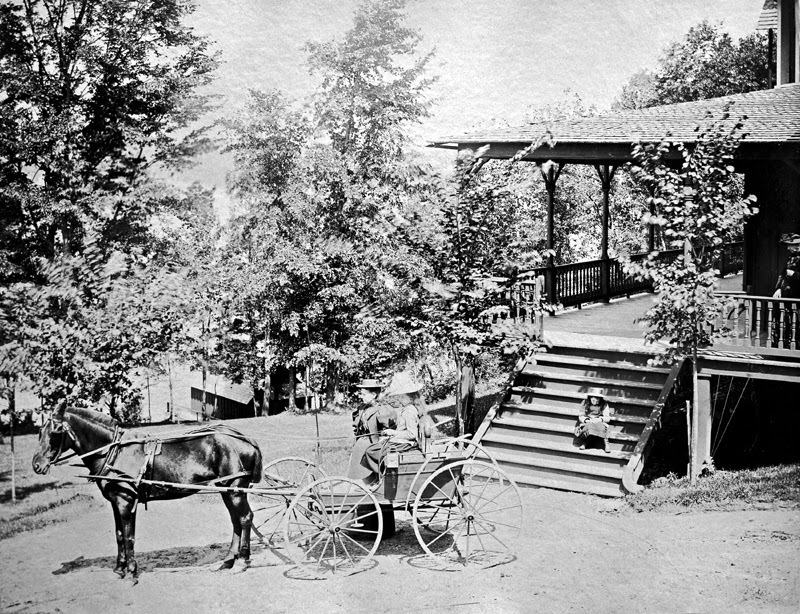 The Bagg family sold their Georgeville house around 1900, but, along with many of their friends, they continued to spend their summers far from Montreal, first at Cacouna, on the St. Lawrence River, downriver from Quebec City, and later near St. Agathe, in the Laurentian mountains north of Montreal, and in Kennebunkport, Maine. Research Remarks: Here are some resources reflecting the history of the Eastern Townships’ English-speaking population. Since the mid-1800s, the majority of area residents have been French-speaking. http://townshipsheritage.com/ The Townships Heritage Web Magazine features articles, old photos and maps. http://www.interment.net/can/qc/stanstead.htm Headstones in the many rural cemeteries around Stanstead County are listed here. http://www.colbycurtis.ca/eng/archives.html This is a link to the archives of the Stanstead Historical Society, located in the Colby-Curtis Museum in Stanstead, Quebec, near the Quebec-Vermont border. http://georgevillequebec.blogspot.ca/ This blog features old postcards of Georgeville and a link to photos from the McCord Museum in Montreal.